^ Facts & Figures. Washington National Cathedral. 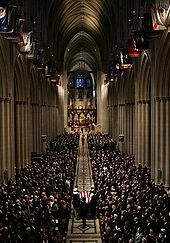 ^ Jayne Clark, "National Cathedral celebrates its centennial", USA Today, June 21, 2007. ^ 存档副本. 2005-04-03 [2005-04-28]. （原始内容存档于2005-04-03）.